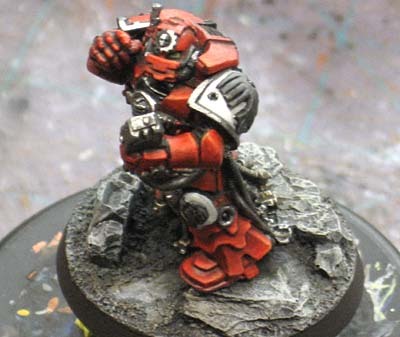 A look at some of the few things you can do to help protect your minis and how to fix them when they do get damaged. 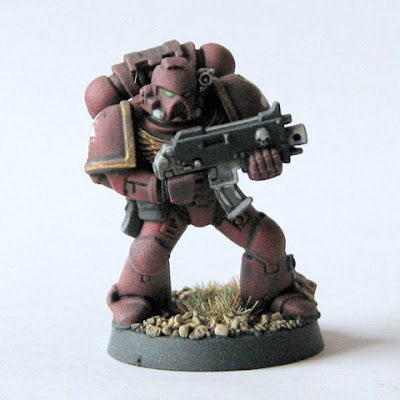 A while ago, I posted this Thunderfire Cannon Techmarine model (completed). Once I had him all done, he got boxed up in foam and shipped off to his owner. Unfortunately, I did not account for two things. 1. The Post Office and just how rough they are with boxes. 2. Pewter models WILL shift in transit no matter how carefully you pack them. Well the Owner promptly told me about this and there was only one solution, Fix the model. Not the Owner do it, but me. I said to ship him back and I would take care of the rest. And so he sent the model back and I've been in the process of repairing it. That's when I figured I'd post about this. Naturally, I have no before pics, but it was amazing to see all the little chips in the paint that happened. I would have never thought it possible. So what's a hobbyist to do? Good question. I think no matter how carefully you handle your models, your bound to drop one eventually or it will get bumped on th table or whatever. Strange things happen in the heat of battle. Things you would never imagine. Something will break at some point and you'll be forced into the role of Field Medic with very few supplies and lots of damage. Of course if you make the joint strong enough, the model may break elsewhere. In the case of this guy, his extra servitor arms are NOT pinned for that very reason. If the model were to fall, I want the arms to break away at the joint. They'll hold up well enough for regular game play, but I don't want the model breaking elsewhere if I were to "fix" the arm connection points so well they never broke again. The rest of the model is too fragile as it is. Sometimes a joint that is magnetized will break away in time of trouble but hold up perfectly well under game conditions. While it's a bit more work on the front end (but has additional benefits), magnets can help troublesome joints hold their integrity. Varnish can help prevent paint chipping. There is the dreaded "frost" we all have to contend with, but a good coat of varnish will go a long way towards adding some much needed protection to your models. Want tips on what to use/not to use? Try this Collaborative Post. Write down your color combinations. Paint something unique? Use some out of the ordinary colors? Write it down! It only takes a second to write down the color combination for things like red armour. Just a quick note of what colors in what sequence. That way, you can reproduce the same results later on after you've long forgotten what colors you used. I do this all the time. If you're going to spend hundreds of dollars on the models, why not drop a few more dollars for a good case and get rid of the cardboard box you're currently toting them around in? I will never understand this one folks. I've got more about this in particular coming up in a few weeks. Look around, the forums, the bulletin boards, BLOGS, etc. See what others have done. Chances are that if you're having a problem with something, someone else already has and found a way to fix it since they had the same issue. And if you're still lost, email me and I'll post the question to the Group to see what we get for a reply. Sometimes you just need to take your model to someone who can do it right when you can't seem to yourself. Whether it be magnets, pinning or whatever... get someone to do it the way you want when you can't. I've had lots of people ask me to "fix" things they weren't able to. This Epidemius model is a perfect example. This one is a bit extreme, but it took resculpting certain parts for it to be a model it's owner could use without problems. Most of you all probably do the majority if not all of these things already. The FTW Modeling section has tons of info on how to make things better. And the Painting section has it's fair share too when you get right down to it. 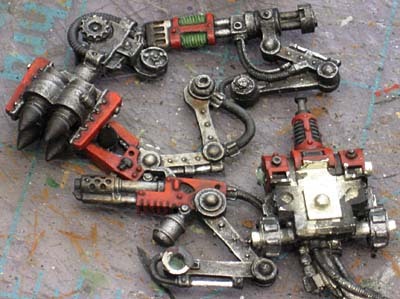 As for me, I have to find my notes so I can match the paint scheme exactly on those servitor backpack arms. not sure if this will help you but my mate is a pro painter who ships stuff around the world all the time. He cuts a thick piece of cardboard the size of the box he's shipping the model in and then fixes the model to the cardboard with those wires covered in plastic before packing them with plastic carrier bags. Must work as he's never had a model broken in transit. Man... I love the "write it down" suggestion. I've failed to do that soo many times. I have a job where at times I won't touch a model for six months. Trying to remember what I did to get half the squad looking right is a huge pain. I'll end up with "close" more often than not. My Ogres are a good example... I spent weeks trying to figure out what I actually did to get the right skin tone. Never figured it out. Col. Good idea. I've gotten to where I basically build a foam case for the model and set it in there. And not just a square opening for the model either, I cut the foam to fit the shape of the model. Reece: If I didn't write things down, I would be completely lost with all the different projects I do. Thank for this post, there is a ton of good info in there and I too like the idea of writing down your colors I can't believe I never thought about such a simple solution, but then again that is what I love about the community, hearing ideas from other gamers. I have been using Gorilla brand super glue and am very impressed with it. It has a very strong bond and has a bit of flex to it, so it is less likely to snap off. I normally wrap a mini in paper towel and then news paper and then it all goes into a sandwich bag which is padded in a box with more news paper. I have to agree with John, I use Gorilla brand super glue on my minis as well and it has held up extremely well! SC John and Meatball: That's one I forgot to add to the list. Use the correct glue for the job. Whether you're using plastic or metal, using the right glue will set you better off in the long run.